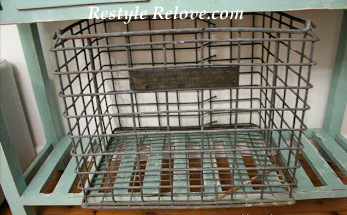 How divine is this vintage metal crate I got on ebay! It's got this really cool metal label which reads to the Australian Glass Manufacturers Company and its owner advised me it was from the 1950's. As cool as it is, it is also enormous! I had pictured it half this size. I should have read the listing more closely. Live and learn. It's the height of a chair and about the same deep and a bit over that wide. Yes, it is huge! I put it under our hall table and it only just fit so it looked out of place. Super cool.If it does not work there you will find a spot for it.You can always hang it on the wall too and use it that way.